What's different with these chilling bullets is that they will keep your drink at right cold temperature without diluting it and ruining its ambrosial flavor. 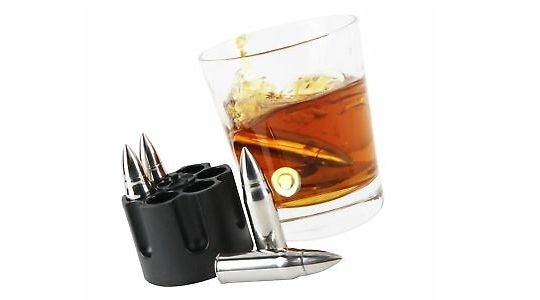 Plus, the stainless steel food safe whiskey bullets will look so virile in your glass. The set of 6 stainless steel whiskey bullets has a revolver cylinder freezer base which will hold your whiskey bullets while they are cooling down in the freezer. The extra large chilling bullets rocks are made up of antibacterial, corrosion resistant and FDA approved 304-grade stainless steel which is perfect to keep your drinks cold. The stainless steel whiskey bullets are also a great gift for friends and family at weddings, engagements, anniversaries, birthdays, Valentine’s day, Father’s Day, groomsmen, military, personnel, and many more occasions!